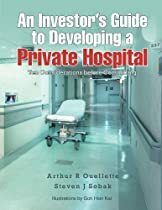 If you’re considering developing a private general acute hospital-or even just thinking about becoming involved-then you need to determine whether the venture is likely to succeed. Arthur R. Ouellette and Steven J. Sobak, Two experienced professionals who have developed and managed hospitals throughout the world, highlight ten key considerations before making a final decision. If you move forward, you’ll learn how to: design a proposed private hospital to maximize its operational success; deploy capital to improve the return on investment over the long term; promote positive relations between medical professionals and the community. Investors will discover the right questions to ask before committing money. Banks will get insights to help them determine whether to extend a loan. Project developers will get tips on boosting efficiency. Architects, students, and politicians involved in providing health-care facilities will also benefit from this important resource. By asking the right questions and proceeding accordingly, you’ll know if investing in a new private hospital will benefit you and your community.